We describe an ELISA-based method that can be used to identify and quantitate proteins in biological samples. In this method, peptides in solution, derived from proteolytic digests of the sample, compete with substrate-attached synthetic peptides for antibodies, also in solution, generated against the chosen peptides. The peptides used for the ELISA are chosen on the basis of their being (i) products of the proteolytic (e.g. tryptic) digestion of the protein to be identified and (ii) unique to the target protein, as far as one can know from the published sequences. In this paper we describe the competition assay and we define the optimal conditions for the most effective assay. We have performed an analysis of the kinetics of interaction between the four components of the assay: the plastic substratum to which the peptide is bound, the bound peptide itself, the competing added peptide, and the antibody that is specific for the peptide and we compare the results of theoretical simulations to the actual data in some model systems. We have developed the Peptidomatrix, a method for the quantitative analysis of proteins in biological samples. The method's main thrust is that peptides, derived from proteolytic digestion of all the proteins in the sample, rather than the proteins themselves, are assayed. The assay is a competition ELISA and in order to obtain quantitative data a calibration curve with synthetic peptides is run in every experiment. In a related paper (Braitbard et al., submitted) we present the application of Peptidomatrix to the detection of four membrane proteins in cell culture and human lymphocytes. Here we present a study of the kinetics of interaction between the four components of the Peptidomatrix: (1) The plastic substratum to which the peptide is bound; (2) the bound peptide itself; (3) the competing added peptide; and (4) the antibody that is specific for the peptide [1, 2]. There have been very many studies, both experimental and theoretical, of ELISA assays using antibody-peptide interactions. In the majority of these studies the antibodies themselves are bound to the plastic substratum [1–13]. These papers had aims that were somewhat different from those with which we are concerned. Some studied the influence of the length of the epitope on the affinity , others the ability to design vaccine according to the nature of the peptide , the identification of antibodies in sera  or understanding the structure of the subunit of the protein . We have been able to find very few examples in which a peptide antigen is bound to the solid support. [2, 9–11]. Again, these papers concern themselves with issues such as the chemical nature of the binding reaction, , which are not coincident with ours, and in none of these is a full theoretical treatment presented. Other studies involve the use of the BIAcore technology [2, 10] and, although very interesting in themselves, do not help us directly in our studies that use a plastic culture dish substratum. We have attempted to fill this gap as far as we are able. To understand the interaction between the various components of our competitive ELISA, one should note that what we are concerned with is not the intrinsic affinity between ligand and antibody but, instead, the avidity. Affinity is the measure of the intrinsic strength of the binding of an epitope to an antibody. Avidity is the operational measure of the overall stability of the complex between antibody and antigen and this is governed by three major factors: (1) The intrinsic affinity of the antibody for the epitope; (2) the valency of the combination between antibody and antigen and (3) the geometric arrangement of the interacting components . To calculate the avidities in our competitive ELISA system we have to consider the kinetics of interaction between the four components of the assay: the plastic substratum to which the peptide is bound, the bound peptide itself, the competing added peptide, and the antibody that is specific for the peptide. The special structures of the peptides and the different possibilities by which they become bound to the plastic substratum influence the avidity, and distinguish it from other antigens such as whole proteins or peptides that are bound to a carrier. Binding between antibodies and their specific polypeptide ligands is conventionally analyzed in terms of operationally measured, hyperbolic binding isotherms. Binding between molecules and the plastic substratum of ELISA plates is likewise analyzed in general in terms of adsorption isotherms. We combined these two approaches and set up models in which the adsorption to the plate is a simple isotherm or a more complex one. Comparison with the experimental data suggests that the peptides bind to the plastic substratum with more than one modality and that, once bound, the peptide displays different affinities for the antibody depending on how it is bound to the plate. The Peptidomatrix assay uses peptides that are chosen as being (i) specific for a target protein and (ii) amongst the products of tryptic digestion of that protein. We subjected the membrane protein transporters MXR (or BCRP i.e. ABCG2) and MRP1 (ABCC1), and the alpha chain of Na,K_ATPase (ATP1A1) to a virtual tryptic digestion and selected all the peptides of length 7 to 15 amino-acids. Each one of these peptides was analyzed using the BLAST program (see methods). The desirable peptide contains only matches that are 5 amino acids or shorter, and a minimal number of them. The peptides chosen are listed in Table 1. The Peptidomatrix assay, as described in the Introduction, is a competition assay (Figure 1) :Peptides are bound to plastic wells. Antibodies specific to the peptide are then added in solution and allowed to bind to the attached peptide in the presence or the absence of a sample digest. A calibration curve is generated in parallel with known quantities of free synthetic peptide. The concentration of soluble peptide in the sample is then measured by interpolation. The assay will be most sensitive when the added peptide blocks the reaction between antibody and bound peptide at the lowest possible concentration. On the other hand, we need to obtain the highest possible signal-to-noise ratio in the final ELISA assay. To explore the optimal conditions for this, we performed a series of experiments in which we varied the amount of bound peptide and the concentration of antibody, before performing the competition with added peptide. Fig 2A depicts the binding of polyclonal antibodies (raised against the peptide MXR P2), at four different dilutions, to peptide MXR P2 bound to the wells of the ELISA plate at increasing concentrations. The bound antibodies are detected by a secondary antibody (anti-rabbit IgG) conjugated to horseradish peroxidase. In Fig 3A, the same manipulations are performed with peptide MXR P3. In each case, the ELISA signal reaches a plateau as the amount of bound peptide is increased; the maximum size of the signal increases with increasing amount of antibody. The data were fitted (using Sigmaplot) to Equation 1 of Materials and Methods, a conventional hyperbolic isotherm, yielding the parameters of Amax (the maximum signal) and Kd (the concentration of bound peptide at which half the maximal increase in signal was obtained), together with a parameter D that represents the signal in the absence of bound peptide. Adding pre-immune serum at the highest concentration gave essentially no increase in signal above background (figs 2A). Figs 2B and 3B depict the signals obtained when we added increasing amounts of the relevant antibody at different fixed amounts of bound peptides MXR P2 and MXR P3. Again, the data for all these figures were fitted using Equation 1 of Materials and Methods, with the kinetic parameters listed in Table 2. Kinetic parameters obtained from the optimization of the Peptidomatrix conditions for peptide MXR P2 and the serum from rabbit # 64850 (see Figure 2) (± SD, n = 3). 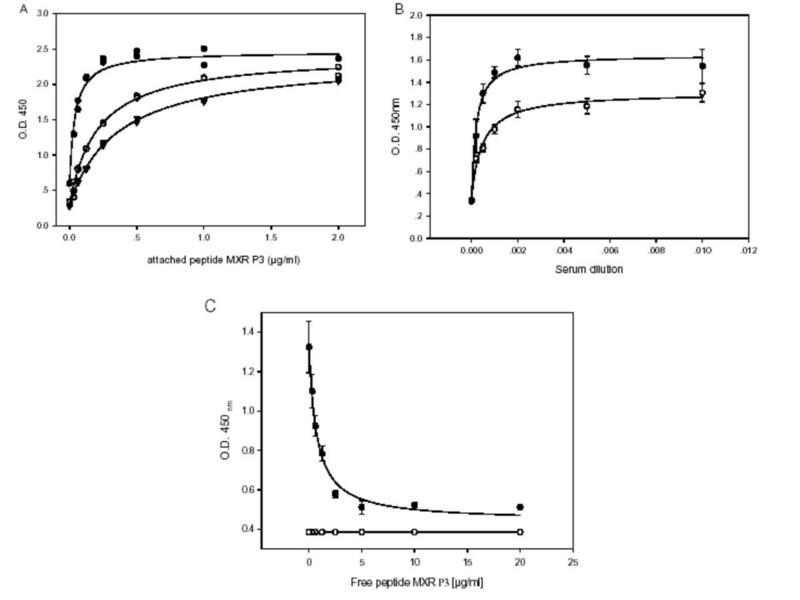 Determination of the optimal conditions for the Peptidomatrix, using the peptide MXR P2 and the serum from rabbit # 64850. (A) Binding of the antibody (at different dilutions) to wells containing increasing amounts of peptide. The actual amount of bound peptide has not been determined and it is assumed that it is proportional to the concentration used for coating the wells. Antibody dilutions: 1:100 (●), 1:200 (○), 1:1000 (▼), 1:2000 (▽) and pre-immune serum 1:100 (◆). (B) Titration of bound peptide with increasing concentrations of antibody (expressed as dilutions of the antiserum) 3 concentrations of attached peptide (1.0 (●) 0.5 (○) and 0.25 (▼) μg/ml) were used. (C) Competition between attached and free peptide using 2 concentration of attached peptide, 0.5 (●) and 0.25 (○) μg/ml, antibody dilution was 1:750. All the data were analyzed using equations 1 and 2 described in the methods. The, values of KdKd, Amax and D appear in Table 2. All the data points represent the average of triplicates. 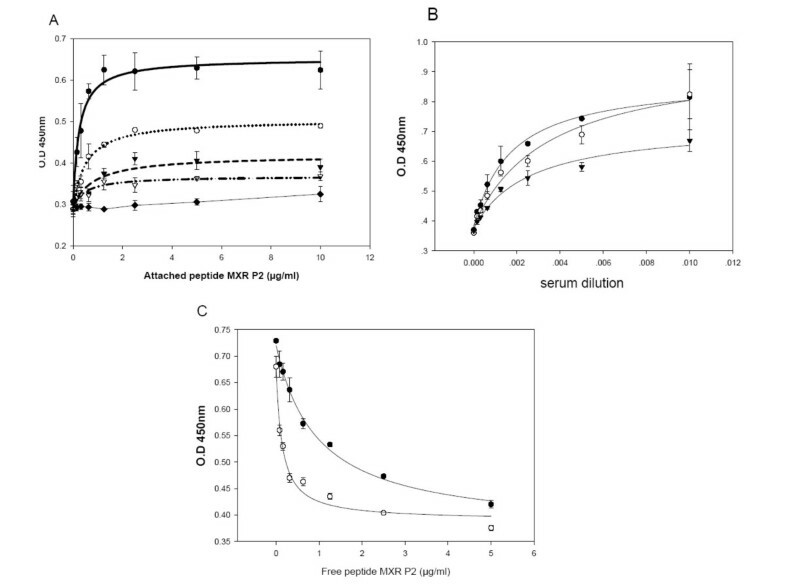 Determination of the optimal conditions for the Peptidomatrix, using the peptide MXR P3 and the serum from rabbit # 64795. 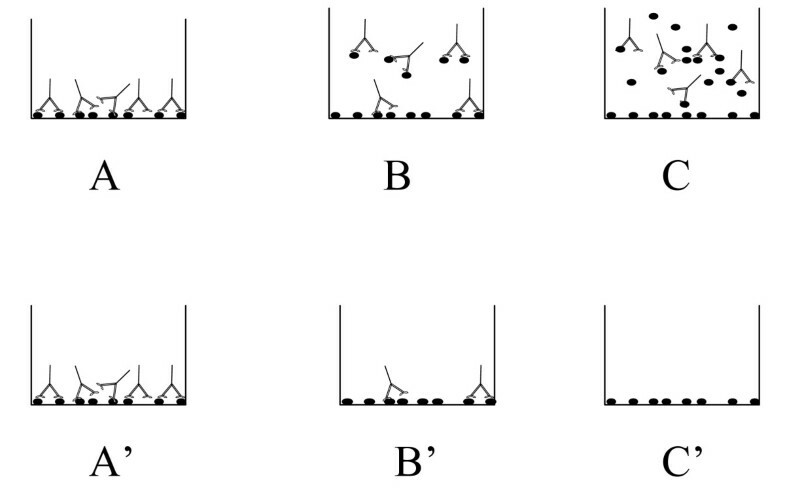 Panels A, B and C are as described in the legend of Figure 2 except that in panel A there is no pre-immune serum reaction AND 1:2000, in panel B only two concentrations of attached peptide (0.5 (●) and 0.25(○)) were used and in panel C there is only one value of attached peptide (0.5 μg/ml), with the other curve being generated with pre-immune serum. The, values of KdKd, Amax and D appear in Table 3. All the data points represent the average of triplicates. Figs 2C and 3C depict competition assays presented as the signals obtained when we chose a single concentration of added antibody and titrated it with increasing concentrations of added free peptide, at two concentrations of bound peptide in Fig 2 but at a single concentration in Fig 3, with the addition of a titration using a non-related peptide depicted in Fig 3C. Figure 4 depicts an analysis of the Peptidomatrix conditions for the detection of the Na,K-ATPase. 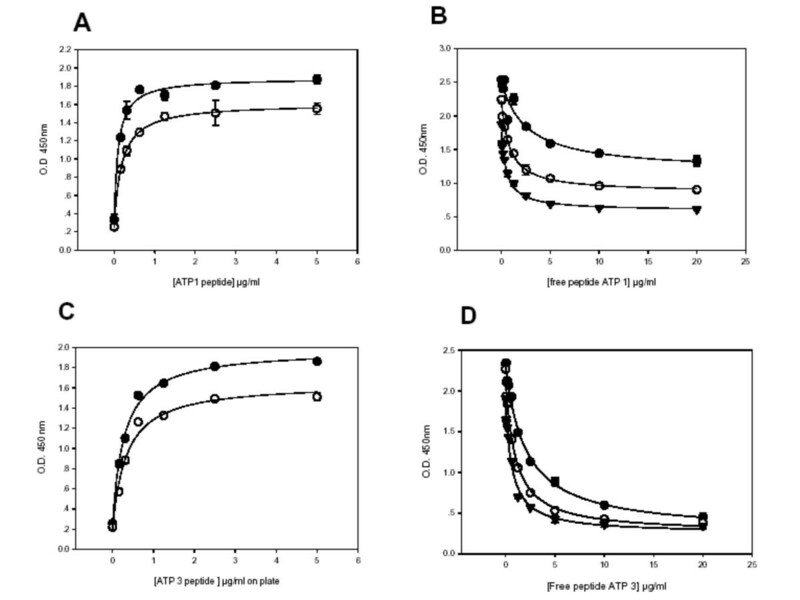 Panels A and C show a titration using increasing concentrations of bound peptides ATP P1 and ATP P3, at two different concentrations of antibody. The parameters obtained by curve fitting of these data are recorded in Table 3. Panels B and D of Fig 4 depict inhibition curves, as in figures 2C and 3C, using the peptides chosen for the Na,K-ATPase, at different concentrations of the appropriate antibody, with parameters recorded in Table 3. Binding of the antibody (at different dilutions) to wells containing increasing amounts of ATPase peptide. In 4A and 4C a different peptide/antibody combination is shown at two different dilutions of the antibody: (●) 1:1500; (○) 1:3000. Panel A: ATP1/RS64845; panel C ATP3/RS64855. Competition between attached and free peptide is depicted in B and D using 3 (dilutions of antibody: (1:400 (●); 1:800 (○); 1:1600 (▼). Peptide/antibody combinations are as in A and C, respectively for B and D. All the data points represent the average of triplicates. Inspection of these figures and Tables shows that the received signal increases with increasing concentrations of either the bound peptide or the appropriate antibody until it reaches a plateau. Comparing the binding curves at increasing amounts of bound peptide or increasing concentrations of antibody we see that the derived Amax, the overall amplitude of the signal, increases accordingly. All this is expected, since increasing either the amount of binding sites or the concentration of the free ligand will increase the signal, until a maximum, and therefore saturation, is reached. With regard to the inhibition (that is, competition) curves there is a similar trend, with Amax (the signal in the absence of externally added peptide) again increasing as function of either the attached peptide or the concentration of the antibody. Also this is expected, since Amax is the expression of the maximal binding of the antibody to the peptide, when there is no competition. It is not immediately obvious, however, whether the values of the half-saturation concentrations, Kd, in the various experimental situations, should increase, decrease or be invariant. Table 4 summarizes the results of all the experiments using the MXR, ATPase and MRP1 peptides in terms of the trends of increase or decrease in the values of Amax and Kd. As expected in all cases, the parameter Amax increases as either the amount of bound peptide or of added antibody is increased. However, in most cases in Columns A (when it is the amount of pre-attached peptide that is continuously varied at fixed amounts of added antibody) and in Column B (antibody varied at fixed attached peptide), the Kd parameter decreases as the amount of bound peptide or of added antibody is raised. In the case of the competition experiments (where it is the concentration of free added peptide that is the variable) Amax again increases with an increase in the amount of bound peptide or of added antibody, but the Kd value increases in both the two conditions (Columns C and D). summary of the results with the different peptides. A-the effect of increasing the amount of antibody. B- the effect of increasing the amount of attached peptide. C- the effect of increasing the amount of attached peptide on the parameters of the competition. D- the effect of increasing the amount of antibody on the parameters of the competition. We attempted to account for these trends in the Amax and Kd data by devising a theoretical equation the takes into account the binding of the peptides to the plastic substratum, the binding of the antibody to the bound peptide and, finally, the interaction between the free peptide and the antibody in the competition experiments. The derivation of the appropriate equations is given in the Appendix. This equation predicts the signal obtained when an amount P of bound peptide is added to a well having a maximal binding capacity of cap and a half-saturation concentration for this binding of Kp, where the concentration of added antibody is A, with a half-saturation concentration for the peptide/antibody isotherm of Ka. Fig 5 depicts the predictions of this equation when, in panel A, the concentration of bound peptide is varied continuously while that of the added antibody is set at different values. In panel B the antibody concentration varies continuously while the amount of bound peptide is varied stepwise. Arbitrary values were assigned to the other constants. These theoretical lines were fitted using equation 1 of the Materials and Methods section to obtain the parameters listed in sections A and B of Table 5. As expected, the Amax values increase with an increase in either bound peptide or added antibody. The Kd values are, however, invariant under these changes, in contrast to what was found experimentally. Figs 5C and 5D depict the theoretical predictions of the appropriate equation (equation A5) for the competition protocol, where it is now free peptide that is added with the added antibody (at varying concentrations of bound peptide and added antibody, Figs 5C and 5D, respectively). Kinetic parameters obtained by simulating the conditions for the Peptidomatrix using equations A2 and A5 (single binding site). Data in Fig 5. Theoretical determination of the optimal conditions for the Peptidomatrix. (A) Binding of the antibody (at different dilutions) to wells containing increasing amounts of peptide,0.1(●),1(○), 10(▼), 100(▽). (B) Titration of bound peptide (different amounts) with increasing concentrations of antibody, 0.1(●), 1(○), 10(▼), 100(▽). (C) Competition between attached and free peptide using 4 concentrations of attached peptide,0.1(●),1(○), 10(▼), 100(▽), first antibody 'dilution' was 10. (D) Competition between attached and free peptide using 4 concentrations of antibody 0.1(●),1(○), 10(▼), 100(▽), 'attached peptide' was 10. All these curves are simulations and were drawn using equation A2 (for panel A and B) and A5 (for panel C and D), with kinetic parameters of Ka = 30, Kp = 10, cap = 50 and Kf = 1, see the appendix for details. All the data were analyzed using the Michaelis-Menten equation (normal and descending hyperbola). The derived values of Kd and Amax appear in table 5. (see the appendix for details). Fitting these lines to equation 2 of Materials and Methods yields the parameters listed in sections C and D of Table 5. In both cases, the parameter Amax increases, as found experimentally. The Kd value, however, is again invariant as the amount of bound peptide is increased (in contrast to the experimental findings), but increases as the amount of added antibody increases (as was found experimentally). In an attempt to resolve the discrepancy between the experimental data and the model predictions, we analyzed a more complex model in which the plastic substratum bears at least two classes of sites to which the peptide can bind. The two classes have different affinities for peptide (Kp1 and Kp2) and the bound peptide then displays a different affinity for a particular antibody (Ka1 and Ka2). (We envisage this as depicted in the diagram of Fig 7, where a peptide is shown as binding at one end only to the substratum or at both ends, and the antibody can then bind with a higher or a lower affinity to the peptide.) The free peptide in the solution binds, of course, with a single affinity Kf, since it binds to the unbound antibody. The equations describing this more complex model are equation A6 for the binding curves and equation A7 for the competition curves. The derivation of these equations can be found in the Appendix. The predictions of the equations are depicted in Fig 6A and 6B (for equation A6) and C and D (for equation A7) and recorded in Table 6. As expected, the values of Amax increase when either the amount of bound peptide or of added antibody increases, but now the value of Kd falls substantially with an increase in these inputs. This is the result found experimentally as listed in Table 4. For the competition protocol, the theoretical predictions are now of an increase in the half saturation concentration for added free peptide when either bound peptide or added antibody is increased. (The effect is small but consistent, when it is the attached peptide that is varied). This is in accord with the experimental data, but is in contrast with the predictions of the simple one-site model, in the case where it is the attached peptide's concentration that is increased. Theoretical determination of the optimal conditions for the Peptidomatrix ACORDING TO 2 SITES. (see the appendix for details). Panels A, B, C and D are as described in the legend of Figure 5 except that the equations used in this case were A6 (for panel A and B) and A7 (for panel C and D). All data were analyzed using the Michaelis-Menten equation (normal and descending hyperbola), using the parameters Ka1 = 30, Ka2 = 3, Kp1 = 10, Kp2 = 100, cap = 50 and Kf = 1. The derived values of Kd and Amax appear in table 6. Reciprocal relationship of peptide-solid support binding and antibody-peptide binding. Our data indicate that when the peptide binds to the plate tightly, with a low Kp, the antibodies bind the peptide more loosely, with high Kd. And, vice versa, if the peptide is bound loosely, then the antibody-peptide bond will be stronger. This figure represents schematically a possible mechanism for this phenomenon. Panel A: The peptide binds with low affinity, represented here with a single attachment point to the solid support. As a result the antibody has facilitated access to the peptide and the peptide -antibody bond is strong. Panel B: The peptide binds tightly, represented here as multiple attachment points. In this case the access of the antibodies is hindered by steric interference and the antibody-peptide bond is weaker. It is worth noting that our results indicate that by changing the concentration of the peptide at the time of plating it is possible to manipulate the strength of the attachment: High concentration of the peptide result in low affinity binding while low concentrations of the peptide result in high affinity binding. Kinetic parameters obtained by simulating the conditions for the Peptidomatrix, using equations A2 and A7 (two binding sites). Data in Fig 6. We undertook these experiments in order to ascertain what might be the most optimal conditions for performing the Peptidomatrix assays. Our aim was to find conditions that would give us the maximum sensitivity (i.e. enable us to detect the smallest possible amount of target protein) and yet the highest possible signal-to-noise ration. The Peptidomatrix assay is done using the competition protocol depicted in Fig 1, experimental results with this protocol being given in Figs 2C, 3C, 4B and 4D and in the Supplementary materials. It is clear that, both in theory and in practice, the highest signal-to-noise ratio is obtained by using plateau values of the bound peptide and of the added antibody. But are these the conditions that will give the maximum sensitivity? Assuming that the peptide binds to the plastic with one modality and that the bound peptide displays one single site to the antibody (one-site binding model) we would predict (Table 5, sections C and D) that the half-saturation concentration for competition by added free peptide in the competition assay would be invariant with respect to amount of bound peptide, but would increase with the concentration of added antibody. A low Kd in the competition assay is the condition for maximum sensitivity, since, in this case, a small amount of externally added peptide can be detected. Thus, the condition of maximum attached peptide and a low added antibody would be the most sensitive situation, yet would give a good signal to noise ratio. But does this one-site model give a correct explanation of the data in a real situation? Experimentally, we find that increasing the amount of attached peptide leads to an apparent higher affinity of antibody to this bound peptide, while increasing the amount of added antibody again leads to higher apparent affinities for the attached peptide. This is in contrast to the predictions of the one site model. Solving the two-site model indeed leads to predictions that more closely model the real situation but, happily, still leave us with a similar recommendation for the conditions that give maximum sensitivity and yet a high signal to noise ratio. Increasing the amount of pre-attached peptide does now lead to an increase in the Kd for competition by added peptide, but this increase is small. 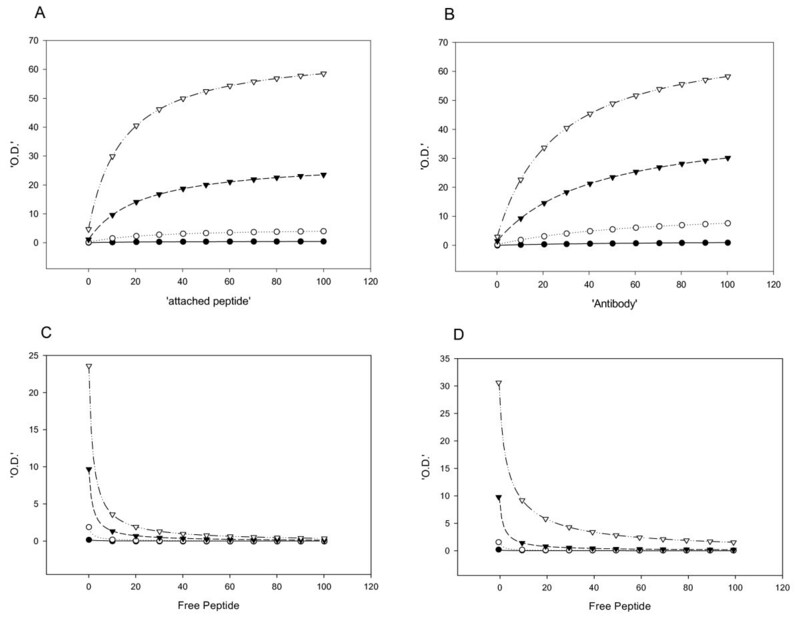 Increasing the amount of added antibody increases the half-saturation concentration for the free peptide, and hence decrease the sensitivity of the assay, yet this effect is smaller for the two site model than for the one-site model. Maximum sensitivity will be found when one uses the maximum possible coating by pre-added peptide and a minimum amount of added antibody, yet enough to give an easily measurable signal. A model that assumes that the peptide binds to the plastic substrate with at least two modalitiesand at least two different binding affinities for the antibody (the two-site model) agrees with the experimental findings. According to this simulation, the peptide molecules that are bound with the highest affinity and hence are bound first, i.e., at the lowest concentrations of added peptide, are those to which the antibody binds with lowest avidity. Thus, as the amount of bound peptide increases, the half-saturation concentration of the attached peptide for antibody substantially decreases (its avidity increases), and the added free peptide is less able to compete. But this effect is not very large and four orders of magnitude of increasing attached peptide raise the Kd for the competing added peptide by less than 50% (Table 6, section C). On the other hand, at a fixed amount of attached peptide, raising the amount of added antibody by a similar four orders of magnitude raises the Kd for the competing peptide four fold. Thus, to obtain the highest sensitivity, together with the highest signal-to-noise ratio, it would appear to be preferable to reduce as far as possible the concentration of the antibody and to increase, rather, the amount of bound peptide. We believe that this phenomenon of the binding in several possible conformations is a universal phenomenon for binding of small peptides to plastic substratum and we have to take this into consideration when we design such an assay. Nothing in our analysis rules out the possibility that there is a continuous distribution of affinities between the substratum and the added peptide in the binding isotherm. We can only state that at least two classes of sites seem to be present. 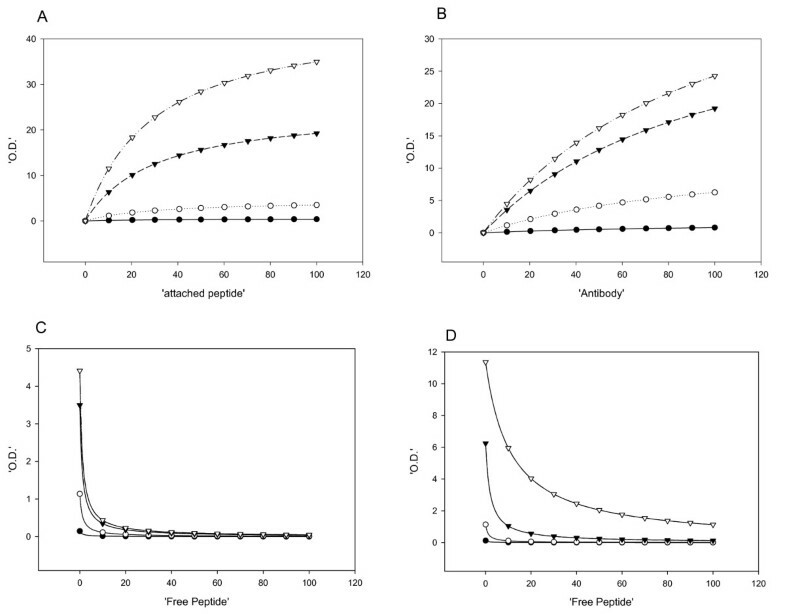 We have conducted a study aimed at the optimization of the Peptidomatrix and developed a theoretical model that explains the experimental data. This model takes into account the interaction of the peptides with the ELISA plate, the interactions of the antibodies with the bound and the free peptides and the competition between them. The peptides chosen for this investigation are shown in Table 1. The polyclonal antibodies used throughout this study were generated in rabbits by Affinity Bioreagents, Inc. (ABR, Golden, CO), whole serum was used in all the experiments. The antigen for immunization was prepared also by ABR, including the synthesis of the peptides, the conjugation to a carrier and the injection to rabbits. The rabbits were bled once before immunization and 3 or 4 times after immunization. The titers were recorded and the various bleedings kept and used for the development of the immunoassay. Maxisorp ELISA plates (NUNC, Denmark) were coated overnight at 4°C, with 0.1–2 μg/ml of the relevant synthetic peptide in 0.1 M carbonate buffer pH 9.6 and blocked 2 hours at room temperature with a blocking buffer containing 3% BSA/0.05 % Tween 20 in phosphate buffered saline (PBS, 0.1 M phosphate buffer, 150 mM NaCl, pH 7.2). For the binding experiments the immune serum was diluted at the desired concentration in blocking buffer. For the competition experiments serial binary dilutions of the synthetic peptide (from 5 to 0.078 μg/ml) and a blank sample were prepared in blocking buffer containing the desired antibody at the desired concentration. 100 μl of these solutions were added to the wells and incubated at room temperature 1–3 hours. The wells were washed 4 times with 1× PBS/0.05% Tween 20 and 100 μl of horseradish peroxidase(HRP)-conjugated 2nd Ab (anti-rabbit) diluted 1:10,000 or 1:20,000 in blocking buffer were added in each well. After incubation for one hour at RT and washing as above, the bound HRP conjugate was detected by adding 100 μl of tetramethyl benzidine (TMB). The peroxidase reaction was stopped after 5- minutes by the addition of 50 μl 0.5 M H2SO4. Optical densities at 450 nm were measured using an ELISA reader. The assay was in triplicates. where Amax is the calculated maximal amplitude of the curve, D the predicted minimum of the ELISA readings, corresponding essentially to the background signal, S the concentration of the antibody or the attached peptide (in equation 1) or the free peptide (in equation 2) and Kd is the concentration that gives one-half of the shift between maximum and minimum readings. The second equation describes the binding, again described by a hyperbola, between the bound peptide and the added antibody, where the concentration of free added antibody is A, with a half-saturation concentration for the attached peptide/antibody isotherm of Ka. The term signal is the ELISA signal obtained, a measure of the antibody that is bound to the peptide that is itself bound to the plastic substratum. which follows the Hyperbolic Decay equation on the variable F.
HG was the first to develop the Peptidomatrix procedure. J B-S further developed the procedure. OB and HG performed most of the experimental work described in this paper. OB wrote the manuscript and developed the model of the two conformations of the peptide. UP provided intellectual guidance and aided in the preparation of the manuscript. WDS initiated the project, developed the mathematical analysis, directed the research and aided preparation of the manuscript.